Russia still hopes to rev up its privatization drive this year, but analysts say tensions with Western countries over Ukraine might kick the can farther down the road. Or so the story goes. True or not, the phrase should have been resounding in the ears of Russia’s top economic policymakers as they watched the Crimean crisis bubble over and reviewed their plans to kick-start Russia’s privatization drive in 2014. Russian officials have long been planning to transfer tens of billions of dollars of state assets into private hands, and as recently as last winter, hopes had been running high that 2014 would be a banner year for privatization sales. No less than Prime Minister Dmitry Medvedev announced that the state hoped to sell over $5 billion worth of assets before the year was out, with much more to come in 2015 and 2016. Others said while Medvedev’s ambitious goal might not be achieved, it at least underscored the seriousness of the state plans. On paper, the current privatization plan sets lofty goals. The government expects that, by 2016, it will complete the process of exiting non-oil sector companies that are not related to resource monopolies and the defense industry. The Russian government currently owns stakes in over 2,300 companies. Of those, about 1,200 are entirely under government control. The rest have some private ownership already. Among assets tagged for sale in 2014, Russian Economy Minister Alexei Ulyukayev has pointed to Sovkomflot, Russia’s largest maritime shipping company, which specializes in transporting oil and liquefied natural gas. One of the biggest sales of the year might be in the telecoms sector. 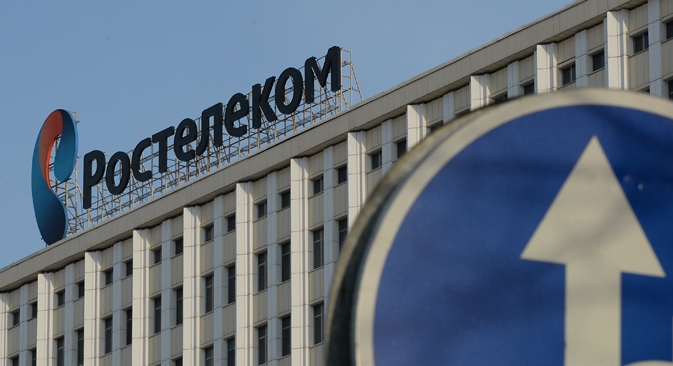 Russia might raise 150 billion rubles from selling a stake in Rostelecom, the country’s leading fixed line provider, said Olga Dergunova, head of the State Property Agency. Mr. Ulyukayev also said the Central Bank of Russia might sell its stake in the Moscow Stock Exchange, and told a government meeting in January that the state could carry out a sale of 5 percent of Russian Railways, according to Interfax. State alcoholic beverage company Rosspirtprom — which, yes, makes vodka — is set to be fully privatized by the end of 2016, according to the government’s plan. Other assets to be sold include shares in Rusnano, the multi-billion dollar nanotechnology fund set up by the government to help stimulate the high-tech sector. Additional shares are also to be listed in Aeroflot, Russia’s largest airline and the legacy firm of the Soviet national carrier. The state is eventually planning to widen investor access to the crown jewel of Russia’s oil industry, Rosneft. Rosneft has emerged during the post-Soviet era from being a minor player to become the world’s biggest oil producer, responsible for four out of every 10 barrels of crude that Russia produces. Rosneft already accomplished a colossal $10.4 billion IPO in 2006. This article is based in part on materials from Kommersant Dengi.